BCAAs are indispensable for athletes. This supplement supports lean muscle growth, boosts energy, and prevents muscle loss. If you are looking for premium quality BCAAs all you need is Firm Foods BCAA! BCAAs (branched-chain amino acids) are made up of 3 amino acids: Leucine, Isoleucine, and Valine. Leucine is considered the most important when it comes to muscle development and repair. Firm Foods BCAA uses the most effective and scientific validated ratio of 2:1:1, which means, you will get 2 grams of Leucine for each gram of Isoleucine or Valine. Together, the BCAAs support lean muscle development, speed up recovery, and fight muscle catabolism – especially during or after high-intensity exercise. Studies show that BCAAs are particularly effective in keeping your lean muscle from getting destroyed by the body to be turned into fuel. When taken intra-workout, the BCAAs act as an alternate source of fuel, keeping your muscles guarded against the body's catabolic actions. Making a Firm Foods BCAA drink is a breeze, as it comes in an ultra-fine powder that dissolves easily (even with a spoon) and mixes perfectly without leaving clumps. The taste is simply extraordinary. Picture a fresh Cola with lime. This is what you will get: a refreshing drink that tastes like real cola with a hint of lime! And best of all, with zero sugar and no aftertaste! What can you expect to achieve when you take Firm Foods BCAA? 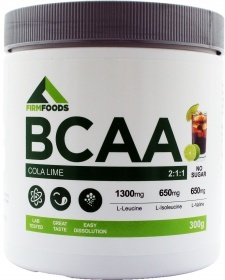 Firm Foods BCAA is the most effective and best tasting BCAA supplement in the market. It is so good it will make you come back for more! Have a question about BCAA? What is it, what does it do, how and when to use or something else? Ask us. “BCAA 300g” is currently out of stock. Enter your details below and we will let you know when it's back in stock. “BCAA 600g” is currently out of stock. Enter your details below and we will let you know when it's back in stock. As a dietary supplement, take 2 servings a day. Take 1 serving (5g) mixed with 300 ml of water before workout and another serving after workout. WARNINGS BCAA : Do not exceed the recommended daily dosage. Keep out of reach of children. The product should not be used in case of hypersensitivity or allergy to any of the ingredients of the formulation. Food supplements should not be used as a substitute for a varied and balanced diet and healthy lifestyle. Store in a cool, dry place. Please Recycle. BEST BEFORE: Please see lot number and expiration date stamped on the packaging.